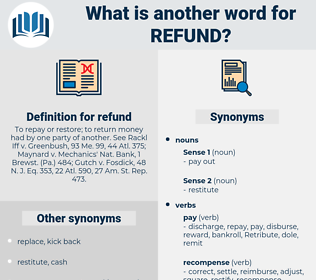 What is another word for refund? To repay or restore; to return money had by one party of another. See Rackl Iff v. Greenbush, 93 Me. 99, 44 Atl. 375; Maynard v. Mechanics' Nat. Bank, 1 Brewst. ( Pa.) 484; Gutch v. Fosdick, 48 N. J. Eq. 353, 22 Atl. 590, 27 Am. St. Rep. 473.
surrender, recuperation, paydown, repatriation, disbursement, defrayal, handover, restituzione, remuneration. Repaid, Rendered, Incurred, paid, Awarded, Claimed. 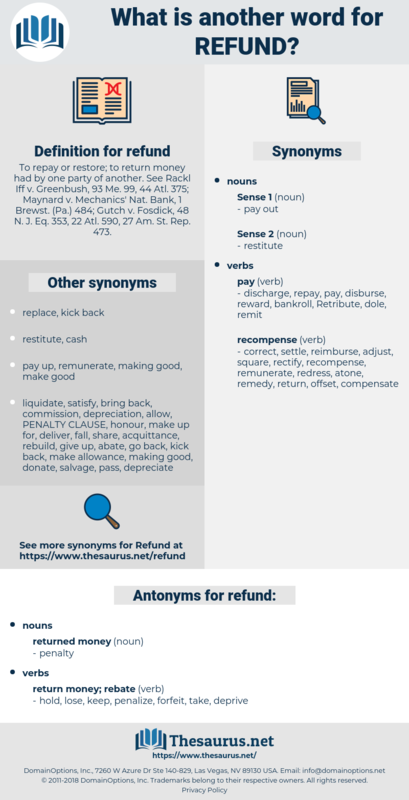 repay, defray, reimburse, redeem, returns, compensate, restore, reinstate. reimbursements, rebate, rebates, restitution, reimbursement, redemption. relinquishment, refundable, rebate, reinstatement, restitution, payments, Payout, reimbursement, redemption. hold, lose, keep, penalize, forfeit, take, deprive. riband, rebind, ripened, repand, repayment, rebound, refinement, rabbinate, repent, refined, ribbonwood, repaint, robin hood, repoint, revenant, ribband, rawboned.